Help us save and protect Africa's top keystone species from the illegal wildlife trade by donating to our CITES (Convention on International Trade in Endangered Species of Wild Fauna and Flora) Fund to send our Co-Founder, Leader, Rosemary Alles and Team Members to the 2019 meeting in Sri Lanka. How CITES Works: CITES is a treaty that regulates international trade in endangered species. Crucial decisions that impact the fate of endangered species will be decided at CoP18 (18th Conference of the Parties), which stands to be the largest conference in the world governing the wildlife trade. 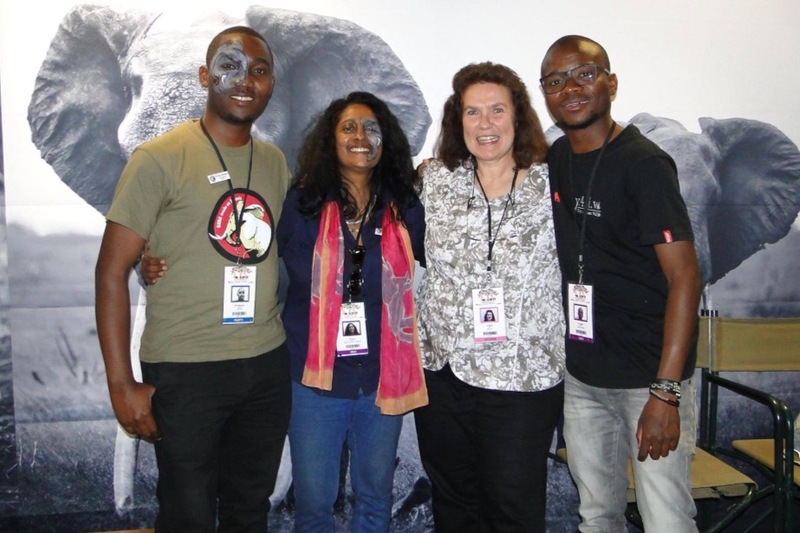 At CoP17 GMFER displayed bold, vocal action. We continue to advocate for the strongest protections possible for elephants, rhinos and lions and will show up in full force at CoP18. This critically important work helps pass laws and policies by governments where endangered species live. Our work has been recognized the U.S. State Department for playing a critical role in saving elephants and rhinos and other threatened species. Join our team! Donate Today! And share with others to support this work! Global March Team at CITES CoP17. * An overwhelming majority voted NOT to extend the mandate to continue an 8-year debate on creating a process to legalize ivory trade in the future. * CITES agreed to recommend countries should urgently close their domestic ivory markets, the first time ever that CITES agreed on closure rather than just regulation of national markets. * A process to develop guidance on management and disposal of ivory stockpiles was also created. * Two proposals that would have allowed ivory to be traded legally on a global scale in the future were rejected. * Botswana, one of the four countries with elephants on Appendix II and who had formerly voted against up-listing elephants, came out in favor of an Appendix I listing. * Swaziland proposal to open up trade in rhino horn was unequivocally rejected. * Unfortunately, lions did not get up-listed to Appendix 1, a huge failure to afford them the strictest protections under international law they so desperately need and deserve. Protected species are listed in one of three appendices, depending on how threatened they are. Appendix 1 provides the greatest degree of protection. Each country that implements CITES designates a Management Authority and Scientific Authority to carry out the treaty. In the U.S., CITES is administered through U.S. Fish & Wildlife Service under the Endangered Species Act. A permit system is used to track and monitor trade. Unfortunately corruption leads to forged paperwork, enabling the illegal wildlife trade to persist.